City lost at Anfield twice last season: 4-3 in the Premier League to end its 22-match unbeaten start, and 3-0 in the Champions League quarterfinals en route to getting eliminated. City manager Pep Guardiola has struggled in matches against Liverpool counterpart Juergen Klopp, winning only one of their six meetings while working in England. Chelsea, the other unbeaten team heading into the eighth round of matches, visits Southampton on Sunday. Manchester United, in 10th place, looks for a first win in five matches across all competitions when it hosts Newcastle on Saturday. Winless in three Spanish league matches and with its defense faltering, first-place Barcelona visits a Valencia side that held Manchester United to a goalless draw in the Champions League in midweek. Barcelona has conceded seven goals in four games, including two in Wednesday’s win at Tottenham in the Champions League. Valencia ended a seven-match winless streak last weekend. Real Madrid, behind Barcelona on goal difference, visits sixth-place Alaves on Saturday still reeling from a Champions League loss at CSKA Moscow on Tuesday. That made it three straight games without scoring for Madrid, after a home draw against Atletico Madrid and a 3-0 loss at Sevilla. Alaves has yet to lose at home and has been one of the early surprises in Spain. Third-place Sevilla, one point behind Madrid and Barcelona, hosts struggling Celta Vigo on Sunday. Sevilla has outscored its opponents 17-4 in its last four matches, and forward Andre Silva is the league’s leading scorer with seven goals. Bayern Munich bids to end a three-game run without a win in a home match against Borussia Moenchengladbach. Bayern lost the league lead last weekend to Borussia Dortmund, which faces Augsburg on Saturday. Augsburg was the side that ended Bayern’s seven-game winning start to the season. Third-place Hertha Berlin visits Mainz on Saturday, when Schalke will look for another win at Fortuna Duesseldorf after ending its five-game losing start last weekend. Bayer Leverkusen visits Freiburg on Sunday, when Leipzig hosts promoted Nuremberg. Given how sloppy Lyon’s defending has been at times this season, a trip to free-scoring Paris Saint-Germain on Sunday is hardly what the club needs. Lyon’s weakness at the back was exposed in the Champions League on Tuesday, when it fell 2-0 behind at home to Shakhtar Donetsk before rallying to draw 2-2. A 6-1 rout of Red Star Belgrade in the Champions League took PSG’s tally of goals to 35 in 10 games overall. Neymar has 10 goals in his last eight games. Victory against Lyon will set a new French record of nine straight league wins. All is going well for PSG’s new coach, Thomas Tuchel, but the pressure is mounting on Monaco’s Leonardo Jardim, who needs a home win against Rennes on Sunday with his side languishing in 18th place and star striker Radamel Falcao out of sorts. Second-place Lille — the season’s surprise package after almost being relegated last season — hosts fourth-place Saint-Etienne on Saturday. 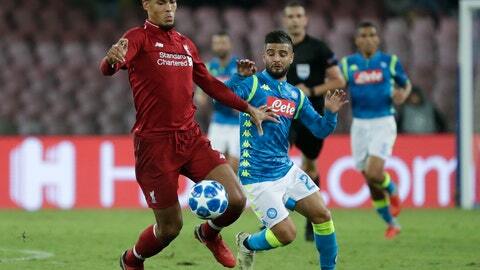 Juventus can extend its perfect start at Udinese, while second-place Napoli hosts Sassuolo looking to build on its Champions League victory over Liverpool in midweek. On a weekend without any standout matches, Roma visits Empoli, AC Milan hosts Chievo Verona and Inter Milan visits Spal in the eighth round of fixtures. In a game featuring two sides that have shown flair in the early weeks, third-place Fiorentina visits seventh-place Lazio. Krzysztof Piatek, who leads the league charts with eight goals, will look for more as Genoa hosts Parma.